We provide a full suite of network planning, integration, and implementation services. Our Solutions Integrators are companies that provide custom solutions through their own unique value-added services and expertise. 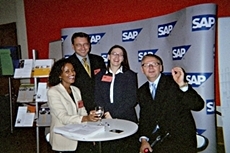 In 2000 we entered the solutions integration business. We selected the best partners in the industry with over thirty years of experience. CBS International understands that it is important to provide customized knowledge in the client’s own industry. Through its local and international alliance and partnerships, bundled together with years of experience CBS International is able to bring top-line service to the various industry groups.